The future of a proposed gondola spanning Edmonton's river valley will be up in the air at Tuesday's city council meeting. The group that wants to build a gondola across Edmonton's river valley is willing to put up money for a required — and expensive — analysis of the plan, but only if city council commits to getting the project off the ground. 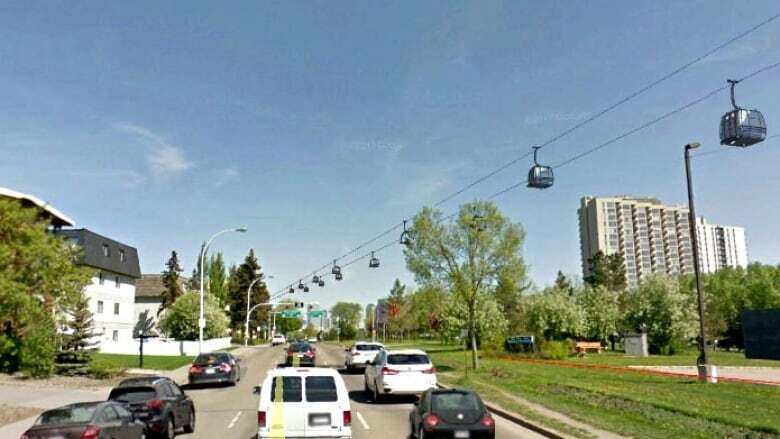 The gondola's future will be on the line at Tuesday's city council meeting when the developers behind Prairie Sky Gondola, a cable car that would carry passengers between downtown and Old Strathcona, ask for the city's approval to pursue a feasibility study. The study is known as a preliminary economic and technical assessment, or PETA, and is considered the first step in assessing whether the proposal is a viable business venture. "It's a go/no-go assessment to see if it's feasible for the city of Edmonton," said Gary Poliquin, one of the project proponents. "If it doesn't work in this area, then why should we continue? "We want to make sure it's a success." Developers with Prairie Sky would put forward $75,000 to complete the assessment. But first, they want a formal agreement that the city supports the project if the study's results are favourable. "We can't officially start the PETA until the city says 'yes,' " Poliquin said in an interview Monday with CBC Radio's Edmonton AM. "We'll pay for it but if we're paying for it we should have some guarantees. … That's part of the discussion that's happening now." As explained in a report from administration, the city has not committed any funds to the project and no financial commitment is required to complete the feasibility assessments. The developers are planning to fully fund the planning, design, construction and operation of the gondola through investment from the private sector, said the report. If the initial assessment is positive, city staff will work the developers to determine next steps. Poliquin stressed that Prairie Sky is only looking for administrative support from the city, not subsidization. The project is expected to cost $110 million, and private investors will foot the bill, he said. "The committee has been approached by investment bankers, consortiums and other people who really want to invest in it so there is no lack of funds," he said. Prairie Sky would like to partner with Edmonton Transit to ensure commuters can easily hop off the bus or train and onto the gondola, but that shouldn't cost taxpayers a thing, Poliquin said. While some councillors have voiced concern over the potential cost to taxpayers, Poliquin hopes the decision-makers at city hall will keep an open mind. The project could breathe new life into the urban core while easing congestion on existing city transit services, he said. "It's been characterized by a couple of councillors that this a subsidy that we're asking for but it's not, Poliquin said. "If we're able to proceed, and the gondola goes, think of the buses that currently go from Old Strathcona to downtown. They could be moved elsewhere. "We know there are some councillors that like it as well. We would like at least an opportunity." The gondola debate started when Poliquin and his wife Amber Poliquin pitched the idea for the Edmonton Project, a competition spearheaded by local businesses for a new Edmonton landmark. The couple's idea won the industry-sponsored competition in March. The proposal includes an eight-car gondola connecting Whyte Avenue and Jasper Avenue at the Edmonton Convention Centre, with a stop at the Rossdale power plant. "Right now, there around 90 urban gondola systems in cities around the world," Poliquin said. "Some are used for tourists, some of them are for actually getting people from one area of the city to another. "It's not new technology. It's new technology for us in terms of our urban environment but it's not rocket science, and it fills a need." If all goes well, the gondola could be constructed within four years, Poliquin said.